Product prices and availability are accurate as of 2018-07-30 20:21:16 GMT and are subject to change. Any price and availability information displayed on http://www.amazon.com/ at the time of purchase will apply to the purchase of this product. 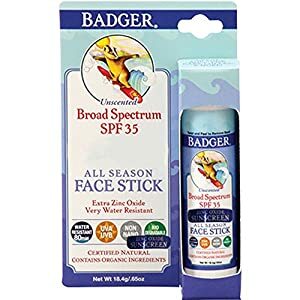 Formulated to safeguard skin from sun, wind, cold, and water as securely and naturally as possible, Badger SPF 35+ Face Stick is an easy-to-use, no-mess stick that fits well in a beach bag, backpack, and carry-on bag. Broad-spectrum UVA and UVB protection for face, ears, nose, lips, and any skin with the mineral zinc oxide. 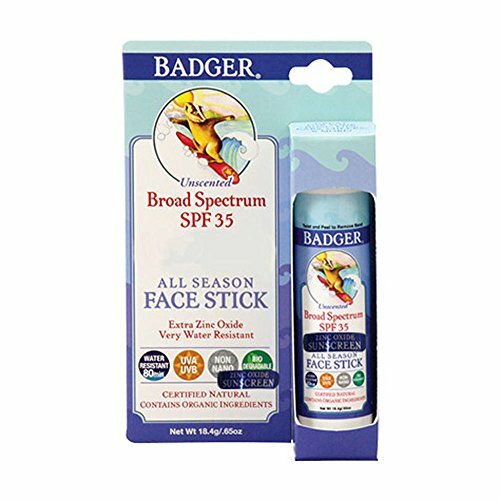 SPF 35+ provides great protection from sun, windburn, and chapping during water sports, winter sports, and extra touch-up protection on the go. Certified natural and chemical-free. Sunscreen balm base is made of only certified organic plant oils and beeswax and is ultramoisturizing, soothing, and safe for you and the environment. 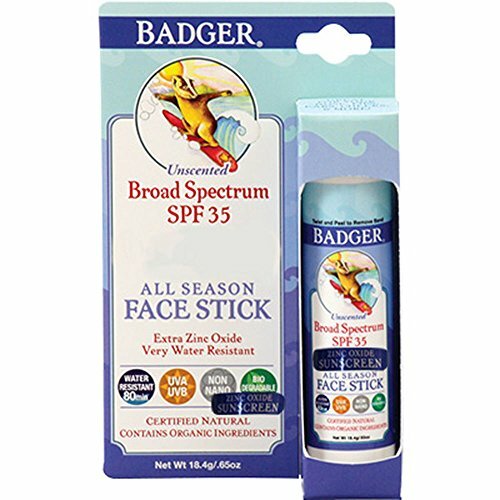 Naturally very water resistant: retains SPF protection up to 80 minutes. Safe for children of all ages. Reef safe and biodegradable. Made from uncoated, non-nano zinc oxide, 22.5 %. Other ingredients: extra-virgin olive oil, beeswax, cocoa butter, Shea butter, and natural vitamin E. 0.65 oz. stick.